AP Govt Dappu Artists Pension Scheme: Andhra Pradesh Govt has introduced Dappu Artists Pension Scheme on 8th October 2018. Eligible persons can apply online or mee seva and check what are the documents required. Type of Pension Monthly Pension. Mode of Registration Mee Seva Centre. on the lines of other Social Security Pensions. The Vision 2029 framework of the Government of Andhra Pradesh, based on the twin pivots of Samaja Vikasam &Kutumba Vikasam and aligned to the Sustainable Development Goals, places emphasis on inclusive development & the commitment of Government towards securing a dignified life to the most vulnerable & poorest among the poor sections of the society. 2. The Dappu is a simple percussion instrument, native to the State of Andhra Pradesh,& an art form in itself. It is also used as an accompanying instrument for all folk performing arts, especially dances, and also used for announcing or publicising any event. 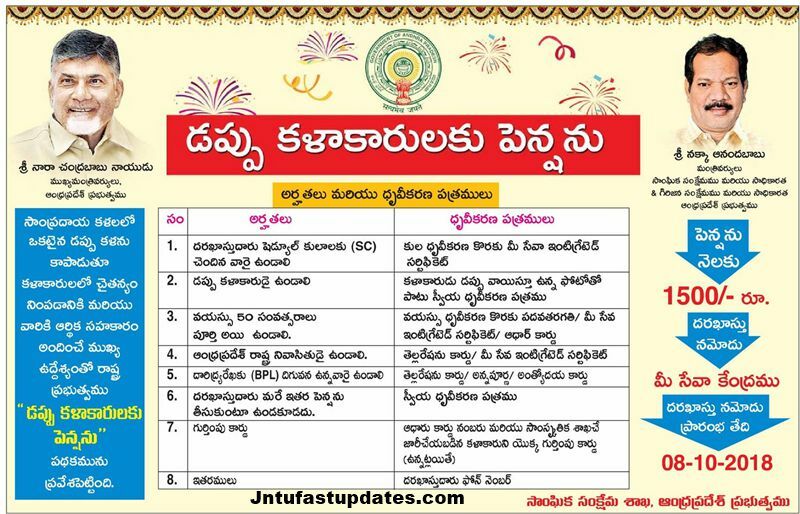 Dappu beating constitutes an integral part of the celebration of any ritual/festivity in Andhra Pradesh. 3. The traditional art form of Dappu, is an almost exclusive preserve of practitioners from the Schedule Castes community,&the art is transmitted from generation to generation. There are many families for whom the Dappu art form is the main livelihood. 4. Due to the passage of time &advancement of modern forms of music,especially electronic instrumentation music,the popularity of the Dappu,has steadily declined. The youth are not attracted towards the Dappu art form, due to opportunities for alternative vocations, while the older artists are not in a position to continue in the profession due to their old age. Furthermore, the seasonal nature of employment and the instability of the income sources has led to Dappu artists constituting a vulnerable section of the society, and Dappu beating a dying art form. 5. In the context stated supra, vide the reference cited, the Director of Social Welfare has submitted a proposal to the Government for introducing a new scheme of Pension to Dappu Artists as a social security measure and for protecting the traditional art form. 6. Government, after careful consideration of the proposal of the Director of Social Welfare, to protect and rejuvenate the traditional art form of Dappu & to address the income vulnerability of the traditional Dappu artists belonging to Schedule Caste community,hereby accords sanction to the new scheme of “Pension to Dappu Artists”, as a social safety net, under the Scheduled Castes Component. 7. Government also notifies the following guidelines for operationalising the new scheme of “Pension to Dappu Artists”. b. Beneficiary shall be a Dappu Artist. Self-Declaration. The Director of Social Welfare will issue guidelines for verification of the applicants & identification of the beneficiaries in consultation with the Culture Department &the stakeholders. c. Beneficiary Age shall be above 50 years. SSC/Mee Seva Integrated Certificate. of A.P. White Ration Card/Mee Seva Integrated Certificate. drawing any other pension. Self-Declaration. This condition shall be verified at database level. g. Proof of Identity. Valid Aadhar number issued by UIDAI.